The Shaker door style, characterized by the signature stile-and-rail recessed panel design, is an American classic that dates back to the eighteenth century. Despite being centuries-old, this timeless design continues to be a mainstay in kitchens across the country. Indeed, the simple design provides the perfect foundation for a number of kitchen styles. Because of this, the decorating options may seemingly be endless, and maybe even somewhat intimidating. In general, the Shaker door style was always meant to be simple and unadorned, so fancy or elaborate hardware is likely to clash. So the question remains, which hardware styles are most appropriate for Shaker cabinetry? 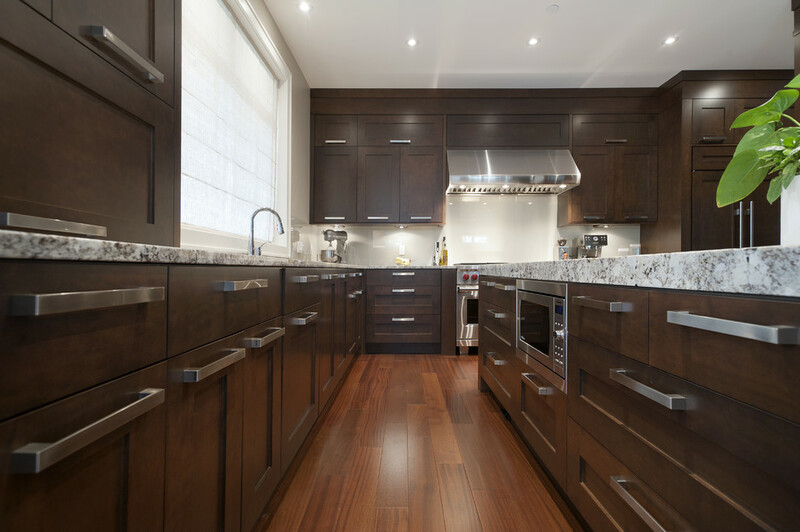 Love the allure of dark cabinetry? Our Pepper Shaker cabinets go great with a number of hardware styles! 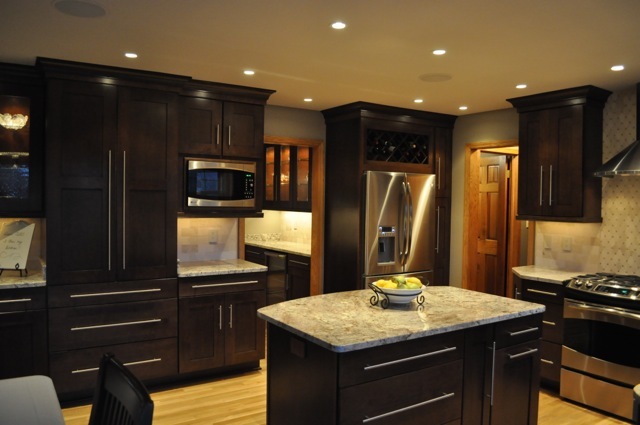 The simplest way to adorn your Shaker cabinetry is to use only knobs on all the cabinet doors and drawers. To achieve a classic or vintage look, circular glass or ceramic knobs are most appropriate. However, if you’re looking for a more updated, contemporary look, choose knobs in chrome, stainless steel, or other metallic material. 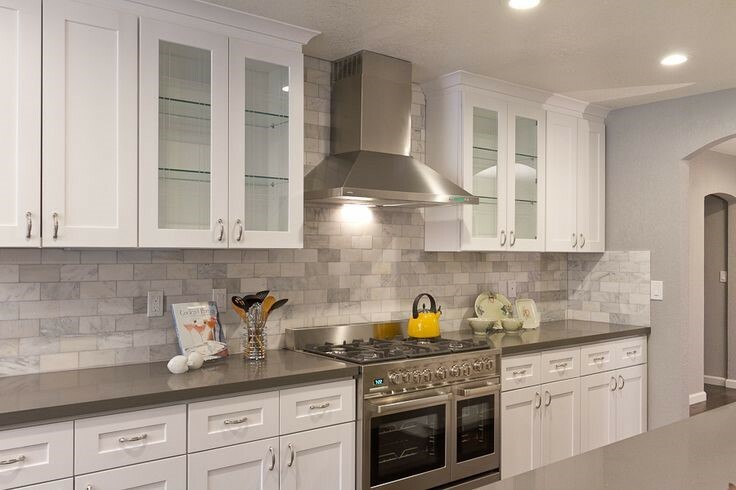 To add more visual interest, square-shaped metal knobs like those pictured above directly complements the symmetrical rectangular design of the Shaker door style. If knobs alone seem a bit boring for your taste, then you may want to throw in some pulls. The knob & pull combination is another popular choice that allows for more variety without being too overbearing on the simple Shaker door style. However, keep in mind that simplicity is key. Choosing elaborately-designed pulls and knobs may cause your kitchen design to look somewhat jumbled. Take your cue from the kitchen above; simple bar pulls paired with square knobs reflect the straight lines of the Shaker style. You can personalize the look to your kitchen design and style preferences by the thickness, size, and material of the hardware you choose. Do you adore a classic white kitchen? 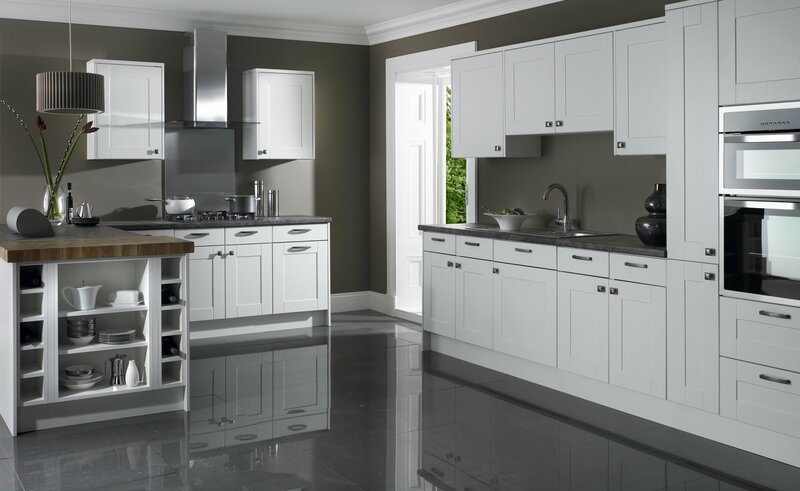 Our Ice White Shaker kitchen cabinets are the perfect choice! For a more interesting take on the knob & pull combination, you may want to opt for cup-shaped bin pulls for your drawers. In addition to making drawers extremely easy to access, the unique shape will give your Shaker kitchen a bit of a vintage feel without doing much work! If you’re keen on the classic white kitchen style, adding bin pulls in brushed chrome or stainless steel is a great way to round out the look. One of the most common choices of hardware for the Shaker cabinet style is the tubular bar pull. This relatively thin, round, and metallic cabinet pull is probably as simple as it gets. The straight line directly parallels the stiles and rails of the Shaker door design, creating a seamless, geometric look that is perfect for a more modern kitchen style. Tubular bar pulls are available in a variety of lengths and styles. If your look leans more towards the traditional, shorter bar pulls are a great way to add a modern touch. Long bar pulls have a more striking effect, adding a bit of drama to contemporary design styles. 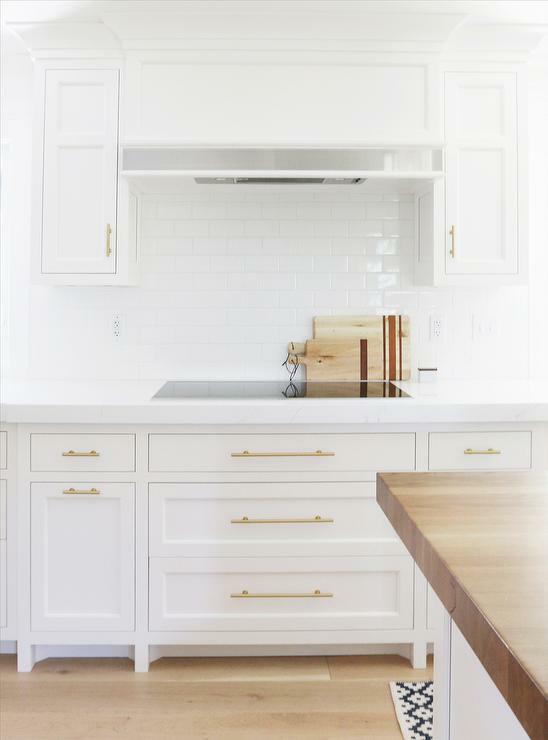 While chrome, stainless steel or other cool metal provides a great contrast to darker Shaker cabinets, warm brass or copper pulls provide a gorgeous adornment for white Shaker cabinets, like in the kitchen pictured below. Like tubular bar pulls, flat bar pulls are also a natural complement to the Shaker door style. Rather than being round in shape, flat bar pulls are rectangular and tend to be thicker. Available in a comparable number of lengths, styles, and finishes, this choice of hardware is perfect for a contemporary look. If straight lines and sharp, square edges characterize your kitchen’s look, then flat bar pulls are the way to go. If you’re attempting to achieve a more modern or contemporary look, stick to the theme of straight, parallel lines. However, if you find the stark sharpness of continuous squares and rectangles to be a bit much for your taste, consider softening the look with arc pulls. As the name suggests, these pulls come in the shape of an arc and can be found in a number of sizes and styles. To keep your look as simple and traditional as possible, small arc pulls are preferable. 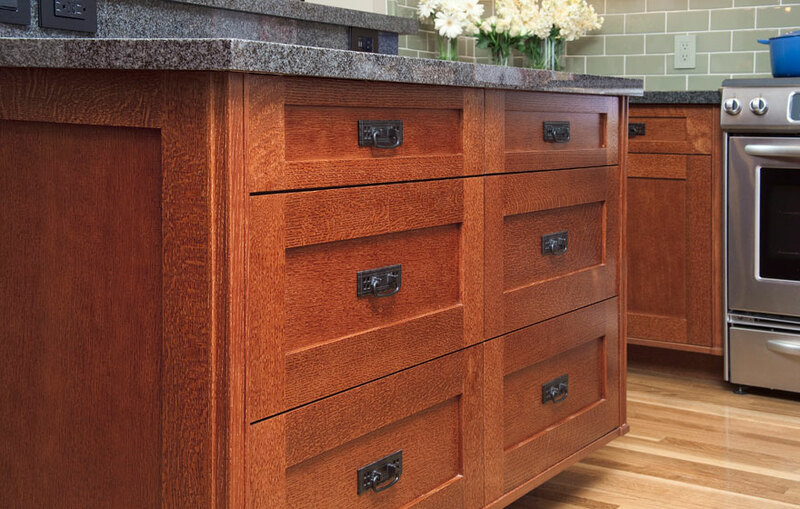 While there are arc pulls available with slightly flared ends and other kinds of detailing, the style is usually simple enough to adorn your Shaker cabinetry without being over the top. If you love the circular contrast that the arc shape lends to the Shaker style but would like a look that’s a bit more dramatic, opt for longer, tubular arc pulls. Standard wire pulls tend to be thin, tubular pulls with a rounded shape, but as with arc pulls, they can found in a number of more detailed styles. They can be found with or without a flat bottom, and with or without small, detailed accents. This type of pull is for a kitchen that is decidedly more traditional than modern, but is usually still simple enough to complement the simplicity of the Shaker style. Love a Shaker style with natural wood grain? 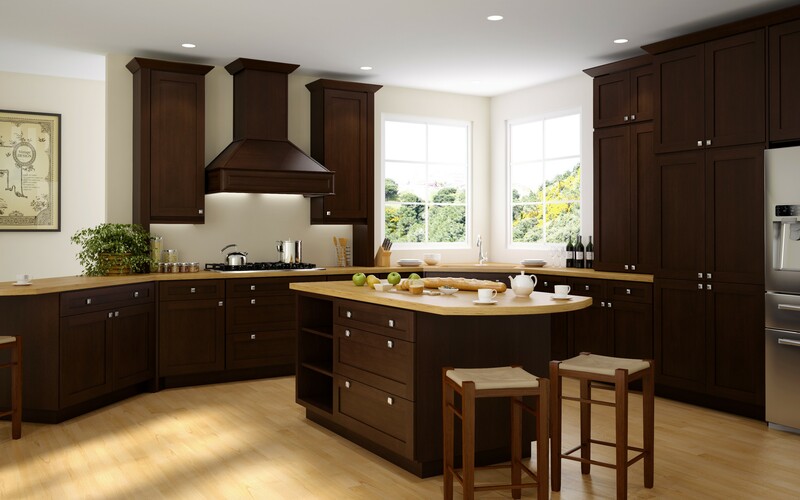 You’ll love our Sturbridge kitchen cabinets! If your personal style leans towards something more eclectic, then simple bar pulls, arc pulls, and even wire pulls may not cut it for you. If this is the case, then you may want to consider a drop pull with a back plate. This style features a hanging handle attached to a square back plate. For visual continuity, the square shape of the back plate is important, as it mimics the rectangular shape of the Shaker stile & rail. This is what prevents this particular kind of hardware from clashing with the door style. While Shaker cabinets demand simple adornments, there’s still a wide variety of hardware styles to choose from. No matter what your personal preference, there’s a hardware style that will perfectly match your kitchen design! 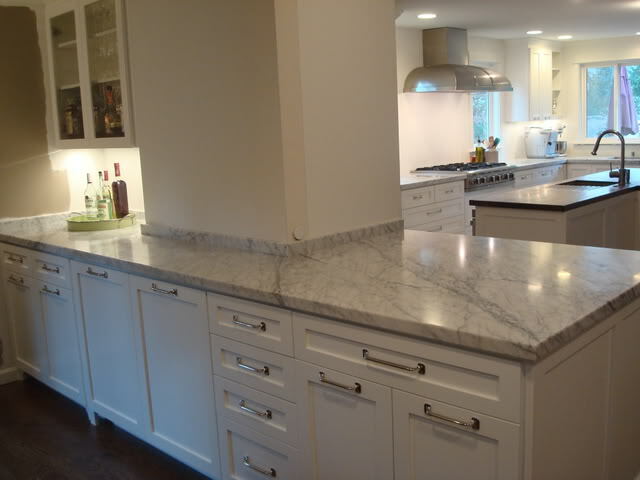 Ice White Shaker kitchen Cabinets: Sophistication At Its Best.